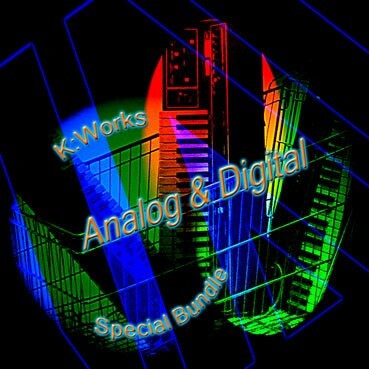 The K:Works - Analog & Digital - Special Bundle includes our K:Works - Analog Volume 1 - Volume 3 and K:Works - Digital Volume 1 - Volume 3 sound program collections for an exclusive discounted price (Worth 179,70 € / Save 30,70 €). Emulation of vintage analog & digital synthesizers (warm analog pads and sweeps, poly synths, experimental and "ice-cold" digital pads, synth basses, mono leads, seq. programs, filtered noises, synth effects, etc.). In addition to this, all Kurzweil K2xxx ROM and FARM "Analog & Digital" sound programs, newly sorted and well organized by Art of Sound to achieve easier access and use, have been added free of charge as a bonus.